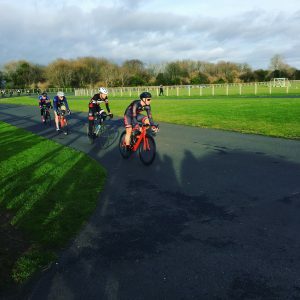 Last week’s winners all followed up with another victory as all four of the races at Round Three of the Odd Down Winter Series saw powerful breakaways hoover up the top spots. However, consistent performances by the other riders near the top of the overall series standings have prevented them pulling out a significant advantage on the rest of the field. The finale of the men’s 2/3 race was marred by a crash with only five laps to go. The last few years at Odd Down have rarely seen large crashes but unfortunately a number of riders were caught behind this crash on the exit of the top hairpin. A touch of wheels brought down Charlie Kelly (BCDS) near the front of the field and there was nowhere for the riders behind to go. The race was briefly halted as the riders were attended to before being restarted with the light fading – fortunately after a visit to hospital for Charlie no serious injuries came about as a result of the crash. Ahead of all of this, three riders were ahead of the bunch; last week’s winner Charlie Revell (Team Tor 2000 Kalas) being pursued by last week’s runner up John Russell (Bristol RC) with Johnny Arcg for company. When the race restarted, there was no catching Revell who powered away for a win by a significant margin. Russell and Arcg were less comfortable with the bunch winching in their 10 second gap. On the final lap Arcg could no longer hold on and that left Russell clear to take second whilst his breakaway companion was swallowed up by the fast closing bunch. 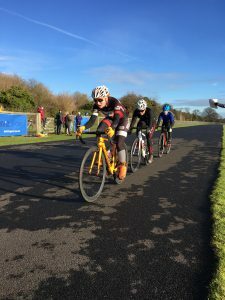 Will Page took the sprint for third on his Winter Series debut and Rob Hardyman (Forever Pedalling) improved on his eighth-place finish last week to come in fourth. 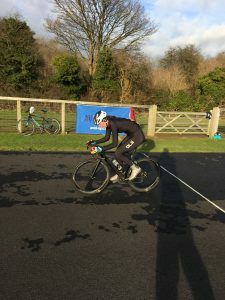 The women’s E/1/2/3 race was also taken by a long-range breakaway – with Elizabeth Pressage (University of Bath CC) showing her TT skills to leave the rest of the field behind going into the last phase of the race. The group had stretched several times over the course of the race but had never split apart – with the exception of IRIS Race Team’s Emily Slavin who had to chase back on several times. Slavin admitted that she needs to get back to the circuit to practice her cornering, but it was an impressive show of persistence and strength to fight her way back to the group on numerous occasions. As the pace ramped up on the final lap for the sprint behind Pressage, it was Round One’s winner Jenny Bolsom (Bikechain – Ricci) who looked to have put herself clear of the others with Radeon BikeScience’s Maria Powell her closest challenger. However, as they came into the finish straight it was Slavin who completed another miraculous recovery to sprint past Bolsom merely metres from the line for second. Bolsom had to settle for third and closing to within five points of the series leader Lauren Johnston. Johnston preserved her lead in the standings the same way as she had established it by taking yet another win in the women’s 4th cat race. Rebekah Nash (University of Bristol CC), who had been second to Johnston in both the previous rounds immediately set to work ripping the field to pieces on the front. With such a large group though, it took an attack from Johnston, joined by Nash and Avid Sport’s Molly Hodges, to fully establish a gap. This trio were in a familiar position now to both the previous rounds and again showed why they have been the class of the women’s 4th cat field. They worked hard together to put the top three positions beyond doubt, with again Johnston overhauling Nash in the sprint. All three of them now move up to third cat, opening the door for the other 4th cats in the next races. One to watch will be the fast finishing Katherine Moore (Das Rad Klub) who used her cyclocross form to great effect to take the group sprint for fourth place ahead of Claire Nott (Army Cycling Union). With the same riders consistently showing their form at the front of the women’s 4th cat race, it was no surprise to see Andrew White (Okehampton CC – last week’s winner), Ben Osborne (NFTO RT – last week’s third place) and Jamie Atkins (University of Bristol CC – second place in Round One) make the decisive move midway through the 4th cat men’s race. Numerous other riders were alert to the danger and tried to get into the move, but the pace at the front was too fierce and so a second chasing group of five riders formed with the main group behind. With what might have been a hard pursuit the race could have all come back together, but the gaps between each group were only growing as Osborne, White and Atkins pressed home their advantage. 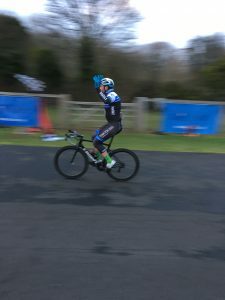 By the closing stages of the race the leading trio had such a gap that although Atkins slipped off the pace he was still comfortably third across the line ahead of his pursuer from Round One: Ed Gray (University of Bath CC) who took the sprint for fourth from the chasing group. There was no denying White at the front though, who didn’t hesitate in the sprint this time to comfortably take the win. White moves up into joint third (with David Mixell – Bikestrong UK) in the overall standings behind Revell (2nd) and Russell (1st).